Unless you’ve been living under a rock like one of the Geico cavemen, you know The Most Interesting Man in the World. He doesn’t always drink beer, but when he does, he drinks Dos Equis. IKD customer Chip is definitely a candidate for The Most Interesting Man in the World. He’s an artist, retired graphic and industrial designer, and a gourmand who loves to cook. You’d think someone with artistic gifts like Chip’s would opt for a high-end kitchen line for his new home. But you’d be wrong. We don’t know about you, but we think Chip and his wife Pam chose wisely. They sent us lots and lots of pictures so let’s dive into their modern white IKEA kitchen. Chip and Pam chose to go the route of new construction for their not-quite-retirement home. After thoroughly vetting their kitchen cabinet options, they realized IKEA was the best value for their money. As Chip points out, all of the hardware such as the door hinges and soft-close dampers are the same quality as more expensive kitchen lines. 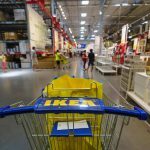 The modular design of IKEA’s kitchen line, SEKTION, also appealed to the couple. Turns out the Most Interesting Man in the World is also a master of kitchen organization. If you love organization you’re gonna love Chip and Pam’s drawers. Spices and baking ingredients live in drawers at one end of the island. Plates and bowls live near the sink. Chip says that the IKEA drawers have proven to be extremely durable and are holding up to about 55lbs like a boss. Extra paper towels are stacked up near the sink and because there’s no door, they’re easy to grab. The dishwasher is next to the refrigerator…. Which is adjacent to an all-important coffee station. Even the coffee station is super organized! All of the kitchen drawers feature the OMLOPP LED strip lights for drawers. 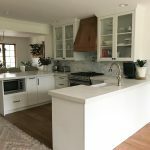 So this IKEA kitchen is really functional and while we agree that functionality has its own beauty, we love the beautiful touches in this modern white IKEA kitchen. Chip and Pam chose the RINGHULT doors in high-gloss white and BLANKETT handles. Their slim profile keeps the kitchen looking super-sleek. 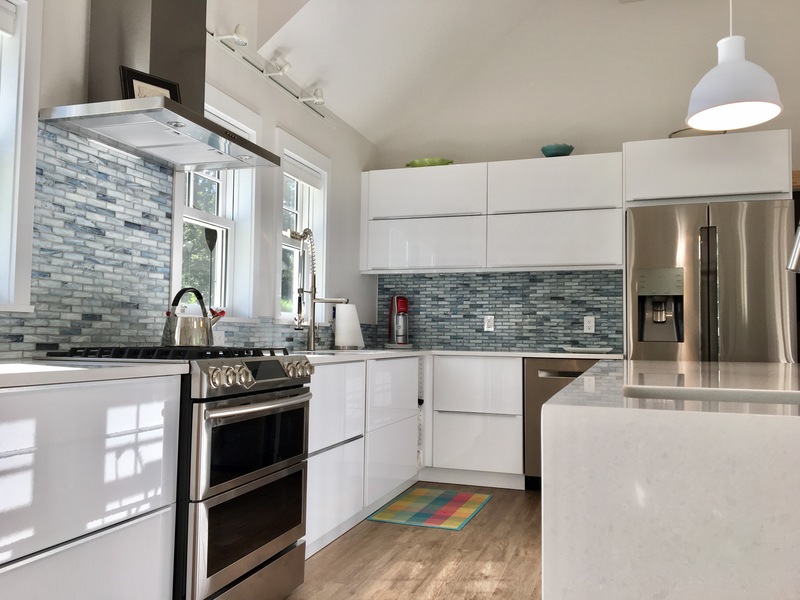 The color in the kitchen comes from the artwork in their home and the blue tile backsplash from Glazzio Tiles in Brooklyn, NY. 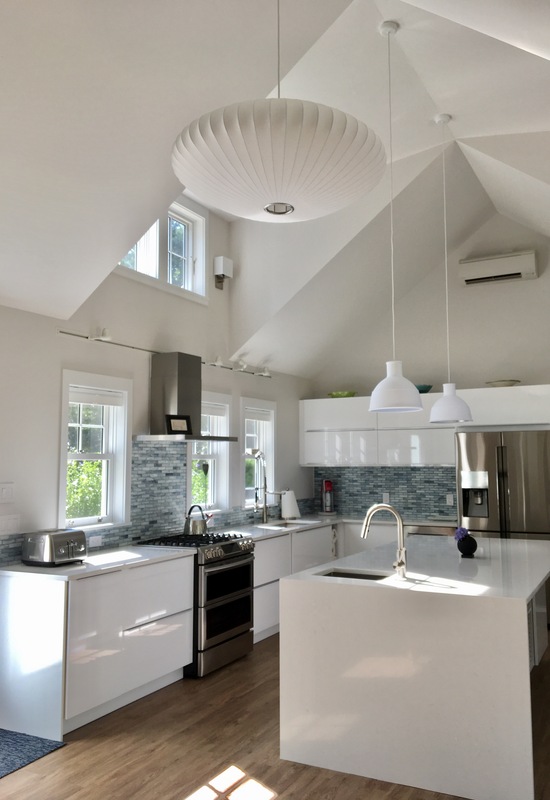 A backsplash like this is in a more traditional style, but it tones down the modern look enough to fit in with the “Cape Cod vernacular” style of the home, which was designed by architect Debra Cedeno of Architecture+Indigo. The oven range is Samsung and the hood is Whirlpool. Another beautiful element of this modern white IKEA kitchen are the horizontal wall cabinets next to and above the refrigerator. The couple store their glasses and serving pieces in these cabinets which are conveniently located above the Bosch dishwasher. There are 2 (Kraus) sinks in the kitchen: one for prep in the island, and the one here for washing up. The funky faucet is also Kraus, but if you want this look for a little less money, try the VIMMERN faucet from IKEA. Chip and Pam were ahead of the large kitchen island trend in their kitchen. As you saw, the island provides a lot of work space and kitchen storage on one side, but the back of the island has surprises. The island is home to Chip’s collection of cookbooks. (Even The Most Interesting Man in the World needs to refer to a cookbook now and then). But a bookcase isn’t the island’s only surprise. There’s also a mini-home office hiding inside that kitchen island. Chip and Pam’s new home is about 1,000 sq feet so rather than have a separate office, they have the essentials stored here, including a compact,WIFI enabled printer. When The Most Interesting Man in the World goes to install his new modern white IKEA kitchen, who does he hire? Adam Hayes of Adam T. Inc is the general contractor who built Chip and Pam’s new home. But Chip and Pam insist on giving Jesse Ward, Adam T. Inc’s head carpenter extra kudos. When I spoke with Chip he also took the time to explain how much he enjoyed working with IKD designer Ana.